See also list of popular enterosorbents. : 201 р. 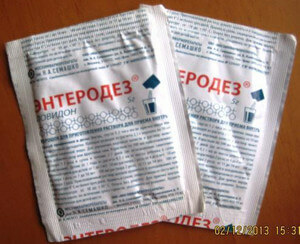 Average online price * : 201 r.
"Enterodez" is an adsorbing powder used to prevent intoxication and the elimination of dangerous carcinogenic and teratogenic compounds from the large and small intestines. The drug is effective in food poisoning and digestive disorders of the infectious type. Enterodes has a lesser effect on toxic elements formed as a result of alcohol and drug intoxication. Povidone, which is the main active ingredient of the drug, is slightly active against metabolic products and metabolites that can release toxins into the blood and other structures of the body. After entering the gastrointestinal tract, Enterodez binds harmful compounds, which come mainly from poor-quality food and polluted water, or are formed in the intestinal lumens as a result of vital activity and functioning of internal organs. severe abnormalities in the functioning of the liver, arising from the intoxication of the organ by decomposition products and toxic compounds. How to prepare a solution? The powder "Enterodez" has a white or yellowish shade with a smell of weak or moderate intensity. 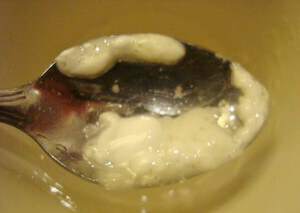 To prepare the oral suspension, it is necessary to mix 5 g of the drug with water (about 100 ml), then mix thoroughly. 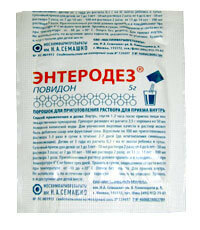 The prepared composition is recommended to drink for 5-10 minutes - storage for a long time is not allowed. Tip ! The finished suspension is not very pleasant taste, so if you can not drink the tool in this form, you can add a small amount of sugar, jam or syrup. You should not mix the suspension with fruit juices, as they contain citric acid (if we are talking about industrial drinks), irritating the stomach walls and aggravating the patient's condition. Dilute the composition can only be natural juice. "Enterodez" need to drink after eating (in 60-120 minutes). The same interval is necessary if the patient receives therapy with other medications. Note! The solution for children is prepared by the following age: 0.3 g of "Enterodez" per kilogram of child's weight mixed with the recommended amount of liquid (based on the values ​​shown in the table). The duration of therapy for adults and children ranges from 2 to 7 days. 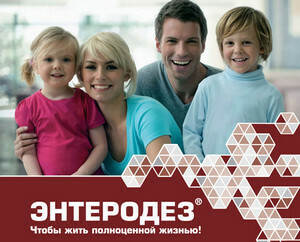 "Enterodez" is not recommended for use in the treatment of children under 12 months, as well as those suffering from hypersensitivity to the ingredients used to prepare the powder. The use of the drug is allowed during pregnancy, as the active substance is not absorbed by the intestinal walls and does not penetrate into the bloodstream. Before use, you should consult your doctor about the possibility of treatment and the consequences for the health of the mother and fetus. Povidone does not penetrate into the composition of breast milk and is not excreted by the mammary glands, therefore, if necessary, it can be administered to lactating women. In some cases, patients experienced bouts of nausea and vomiting (vomiting). These phenomena were of a temporary nature and completely disappeared on the 2nd day of taking the suspension. The occurrence of allergic reactions is not excluded. In case of an accidental overdose with “Enterodesis”, side effects can be increased and their severity may increase. Deciding on the need for therapy, as well as to carry out its appointment should the attending physician. 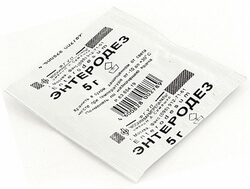 "Enterodez" is a monocomponent medicine consisting of povidone (low molecular weight medical polyvinylpyrrolidone), which is a freeze-dried hygroscopic white powder. The tool is packaged in paper bags weighing 5 g.
The drug is not absorbed by the walls of the digestive tract and is not split. Excreted from the body naturally with feces. The shelf life of the powder is 2 years (until the expiration date) at a temperature not lower than -10 degrees. The maximum allowable storage temperature is 30 degrees. The finished suspension can be stored in the refrigerator (not higher than 4 degrees) for 72 hours (the manufacturer recommends drinking the solution immediately after preparation).